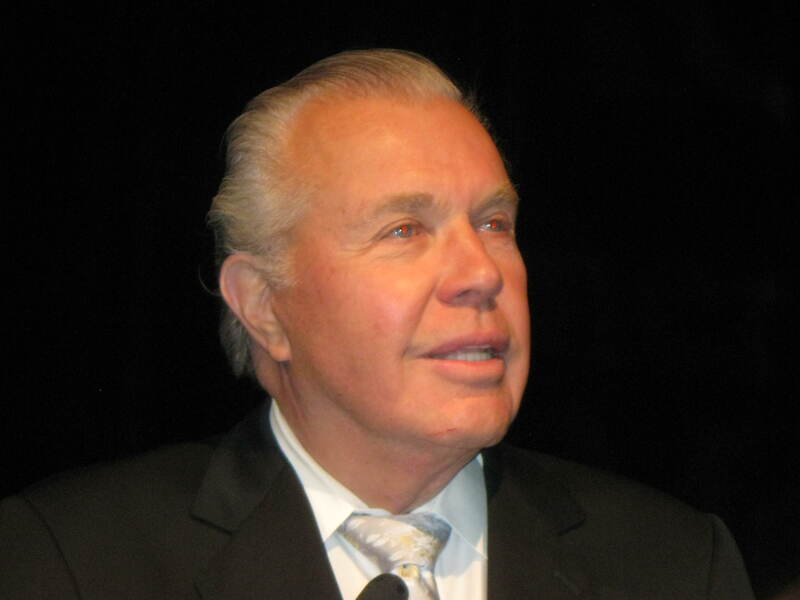 The esteem that practitioners of Mohs micrographic surgery hold for the founder of the technique, the late Dr. Frederic E. Mohs, can’t be overestimated. Although he died in 2002 at the age of 92, the man and his accomplishments are still so admired that the American College of Mohs Surgery invited his son, Frederic E. Mohs, Jr., to share reminiscences of his father at the college’s annual meeting. Hundreds of Mohs surgeons filled the conference hall. “Dad would have been totally shocked to walk in here and see this many people,” Mr. Mohs said, because there was a time when the only Mohs surgeons were ones that Dr. Mohs had trained himself. Today there are at least two Mohs professional organizations and thousands of physicians who offer Mohs surgery. Mr. Mohs is not one of them. 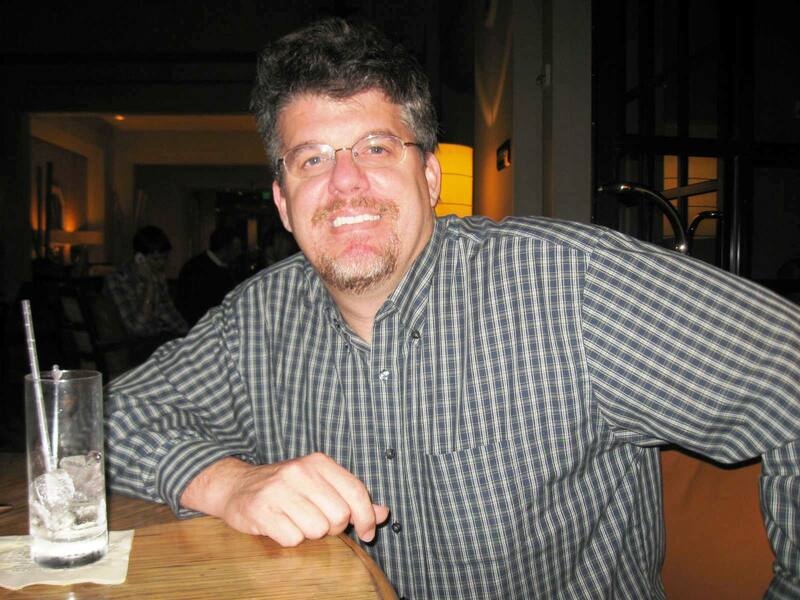 He is a lawyer and real estate specialist in the firm Mohs, MacDonald, Widder, and Paradise in Madison, Wisc., where Dr. Mohs lived and practiced for many years. And he is not, it seemed clear, an experienced public speaker. But the attention focused on him by the ballroom full of Mohs surgeons was so intense that you could have heard a pin drop throughout his entire talk. They listened partly out of respect and partly, I think, because our human nature is to want to know more about the people we admire. Mr. Mohs said he came to talk about his father “as a person.” But he also provided some interesting historical context. The way his father came to be a surgeon and the inventor of Mohs micrographic surgery was “an accident,” Mr. Mohs said. His father had a passion for radio and hoped to become an engineer. To fund his college education, he worked in the University of Wisconsin’s biology department cleaning laboratory animals’ cages. The department chair noticed him and mentored him, explaining the lab’s cancer research and teaching Mohs Sr. to look at slides of skin cancer. It was during this period that Mohs Sr. visualized his now-famous techniques, and the department chair offered him a chance to pursue research as his assistant. That almost didn’t happen, because Mohs Sr. was reluctant to give up his dream of being a radio engineer. But once he embraced the opportunity, he ran with it. He earned his bachelor’s degree in 3 years and entered medical school while continuing his laboratory experiments and cleaning rat cages. “He was a hard worker,” his son said understatedly. Some characteristics of Dr. Mohs “the person” seem dated, while others may be inspiring, disappointing, or surprising, depending on your view. “From every account I ever heard, he was an incredibly wild driver” who once got his future wife grounded for a full year by slamming on the brakes and causing the car to spin in a circle in front of his future father-in-law, Mr. Mohs recalled. Dr. Mohs was a devotee of Horatio Alger’s books, admiring their themes of hard work, ingenuity, and a scientific system of inquiry. Once married and with a young family, he didn’t spend much time at home, it seems. He would leave home at 8 in the morning, return for dinner at 6 p.m., briefly read the newspaper, then go back to the hospital “every single night” and return late at night or even the next morning, his son said. When the family entertained visitors on weekends, most bored Dr. Mohs, so he would go back to the hospital. Occasionally Dr. Mohs broke out of his routine, joining a geology club in one period, and a church’s board of directors in another. As his techniques gained recognition, he traveled quite a bit to give presentations or trainings, and often took the family with him. In 1955 when he was invited to demonstrate his techniques in Moscow, he accepted in part out of a desire to improve international relations. Dr. Mohs went so far as to learn Russian and gave his entire presentation in Russian. Thereafter, the Russians “lionized him” and often sent surgeons to Madison to learn from him. He is still lionized today. But for one hour, his professional descendants got to hear about the human being behind the public image. Before Dr. Mohs died, he picked a simple bronze plate to mark his grave. “He liked the idea. Mowing was more efficient,” his son said. The month of May marked 25 years since dermatologists began using the ABCD rule to help screen for melanoma, and advances in diagnosis since then have leaned toward newer and better use of imaging technology instead of clinical mnemonics. 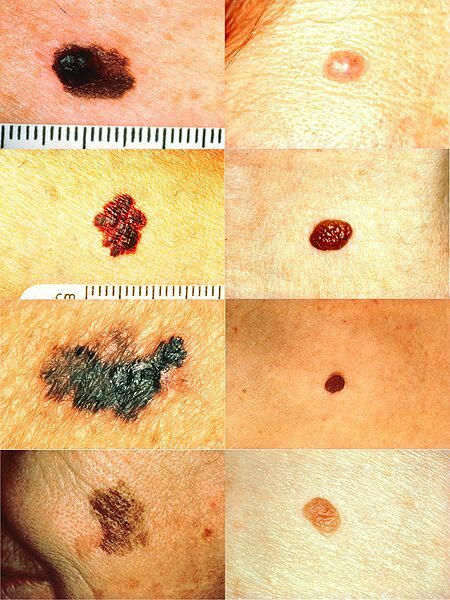 Left side, top to bottom: melanomas showing (A) asymmetry, (B) irregular border, (C) unusual coloring, and (D) diameter that had changed in size. Right column: Normal moles. Images from National Cancer Institute via Skin Cancer Foundation, merged by WikiMedia Commons user Stevenfruitsmaak. You do know your ABCDs, don’t you? Moles with “A” for asymmetry, “B” for border irregularity, “C” for uneven color, or “D” for diameter greater than 6 mm. If you see these, think melanoma. Advances over the quarter-century since then have focused on helping physicians “see” melanoma better. Dr. Darrel Rigel described some of these at the annual meeting of the American Society for Mohs Surgery. Dermoscopy allowed non-invasive imaging of melanomas. Digital photography came along, and some dermatologists began using serial digital imaging to track changes in moles over time. Most recently, various groups have been trying to add assessments using infrared (non-visible) light through computer-aided programs to aide diagnosis. As a woman of letters, I have to admit a fondness for the ABCDs. But the imaging advances do have more of a new-school, digital-age feel to them. I think both can happily co-exist in dermatology. Time will tell if that’s old-school thinking as the digital age advances. That’s my 30-year-old daughter, justifying her recent trip to the tanning salon. Yes, she knew it caused wrinkles. Yes, she knew it was linked to skin cancer. But she heeded not a single warning—either from me as a concerned mother, still nagging after all these years, or as a medical reporter who sees the data over and over. 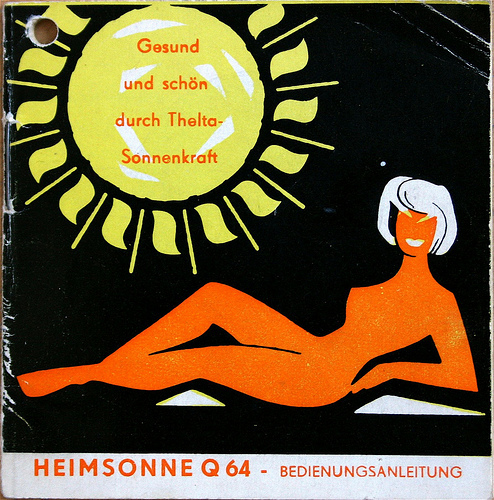 1960s ad for a East German solar lamp promises a quick and healthy tan. Courtesy Flickr user allerleirau (CC). My most recent eye-opener came last week at the WONCA World Conference of Family Physicians, where Dr. Tina Ninan said it plainly: When it comes to tanning, vanity is queen. Dr. Ninan, a general practice physician in Newcastle-Upon-Tyne, England, wanted to find out how much patients know about sunbeds and their associated risks. She distributed simple surveys to patients waiting at a dermatology clinic at the University Hospital of North Durham. Most of the respondents were women, with 60% over age 40. Of the 102 patients surveyed, 34 said they used sunbeds. Most of these (27) were women, meaning that 42% of the women surveyed admitted to using the devices. But they weren’t alone—18% of men surveyed said they used sunbeds, too. But apparently the lure of a tan is too strong to resist. The majority (64%) said they used sunbeds for cosmetic reasons, either they were trying to get a base tan before holiday or they just “liked the look of a tan.” Fourteen percent said they were trying to treat a skin condition with ultraviolet light; acne and rosacea topped that list. 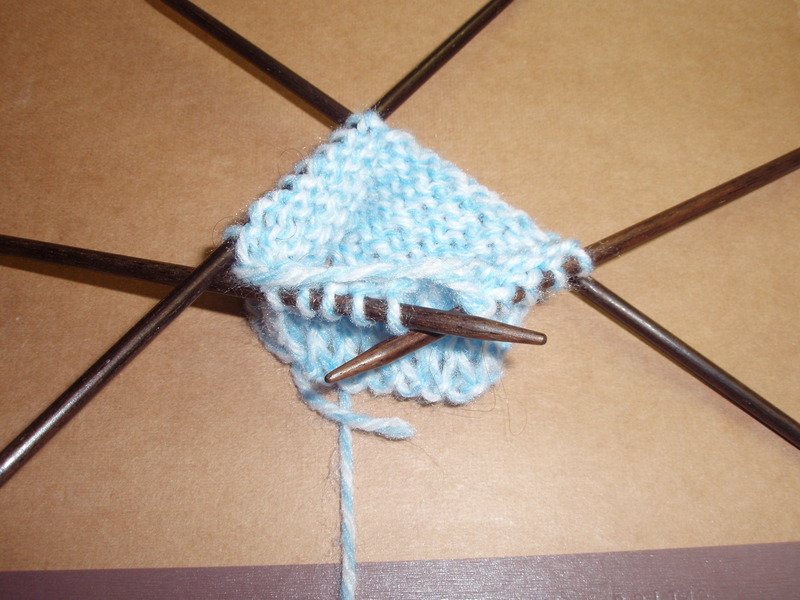 Courtesy by Flickr user redspotted (CC). 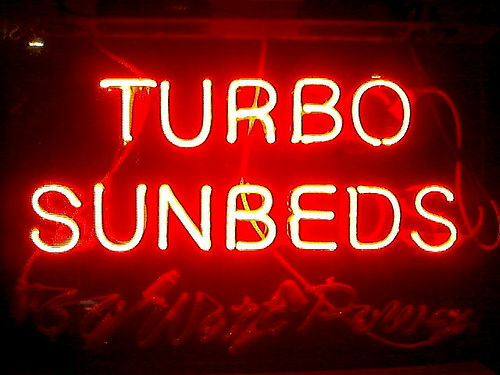 A recent study that found sunbed tanning as addicting as alcohol. Published in the Archives of Dermatology, the study used two validated addiction questionnaires to qualify sunbed use among 421 women at a northeast U.S. university. More than half of the women were “users.” When using the DSM-IV addiction criteria, 39% scored as addicts. The CAGE (Cut down, Annoyed, Guilty, Eye-opener) Questionnaire determined that 90% were addicted. “Users” also had significantly more anxiety and greater use of alcohol, marijuana, and other substances than non-users. So what’s a white girl to do? Spray-on tans are becoming increasingly popular, as are pills containing beta carotene or canthaxathin, a natural food colorant. A quick Google search also delivers plenty of results for pills that claim to stimulate melanin production. I found just one product currently under scientific review. Clinuvel, an Australian drug company, is developing what it calls a “photoprotective drug” (afamelanotide), marketed under the name Scenesse. A form of alpha-melanocyte stimulating hormone, afamelanotide is being investigated for prophylaxis of photosensitive disorders, not for any cosmetic indications. It doesn’t take a leap of imagination, however, to wonder whether it could become—literally—the Golden Child of the self-tanning set. In the meantime, I’ll keep preaching the gospel of high SPF to all my children, and try to follow my own advice. I came back from the WONCA meeting Cancun with a little glow myself, and—although I hate to admit it—I loved the way it looked. Will FDA Deliver a Knock-Out Punch to Indoor Tanning? The Food and Drug Administration has announced that it will finally be taking a closer look at the health effects of indoor tanning, starting with an advisory committee meeting on March 25. Considering that the agency has taken a decade (and counting) to release regulations guiding the manufacture, composition, and advertising of sunscreens, the FDA is acting relatively quickly on indoor tanning. Dermatologists, cancer advocates, and pediatricians, among others, have been seeking some kind of stricter regulations on indoor tanning, or, more hopefully, an outright ban. Many states and localities have begun to restrict the use of indoor tanning by minors. 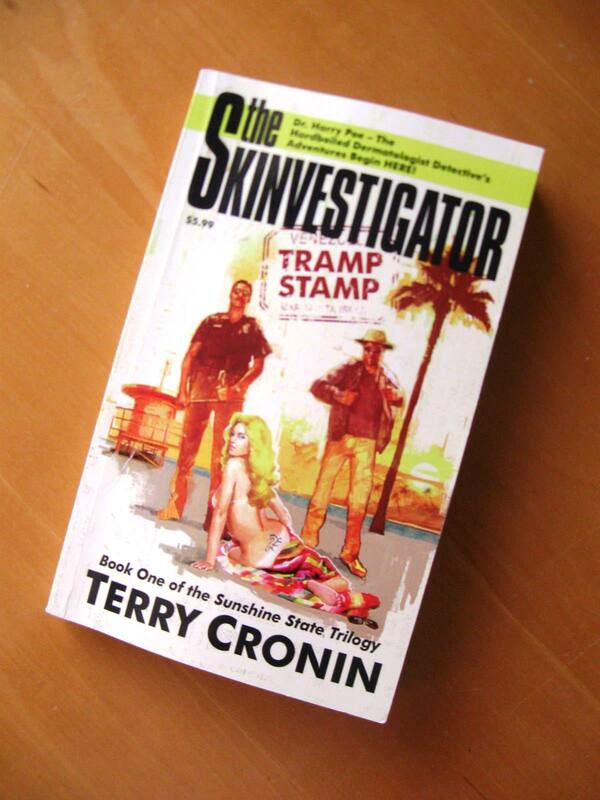 But, despite a wealth of evidence that excessive exposure to ultraviolet radiation, even when delivered indoors, leads to skin cancer, the federal government has not moved to more strictly police tanning salons. Congress has been prodding the FDA for years. In 2007, the Tanning Accountability and Notification Act was included in the Food and Drug Administration Amendments Act of 2007. 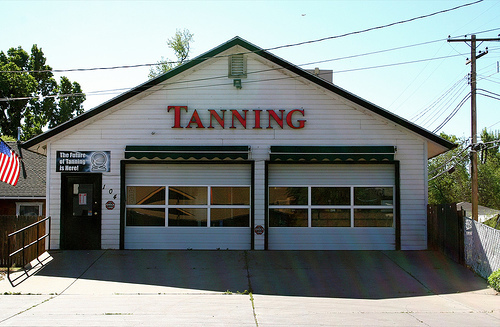 The TAN Act (see page 36 here) directed the FDA to study tanning bed warning labels that had been in place since 1985, with an eye toward making them more prominent and comprehensible by consumers. The FDA was then to report back to Congress. In December 2008, the agency told lawmakers in its required report that it was considering updating the warning labels. A series of focus groups led it to believe that maybe the almost-quarter-century-old labels might have reached their expiration date. A year later, the FDA created a web page warning consumers about the dangers of tanning indoors. Expect a lively discussion at the meeting, with likely appearances by tanning salon owners and the Indoor Tanning Association. Those groups are already unhappy about a 10% tax on tanning users that’s being proposed as part of health reform. The agency usually takes its advisory committees’ advice to heart. We’ll be keeping an eye on this panel’s proceedings. This post also appears on The Mole, the blog of Skin & Allergy News, an International Medical News Group/Elsevier publication.